How to get rid of swollen upper lip at home? Do you notice that your upper lip swell upon waking up in the morning? Swelling of the upper lip is usually not harmful, but if the swelling gets severe and has been there for a long period of time, then it warrants immediate medical attention. Injury and trauma to the upper lip – Your lip will swell if it is hit by a blunt object. Other activities that might cause trauma and injury to the upper lip include dental procedures, lip surgery, piercing on the upper lip, accidental biting of the lips, burning such as intake of hot food, kissing, playing musical instrument using the mouth, injury caused by dental braces, and botox. 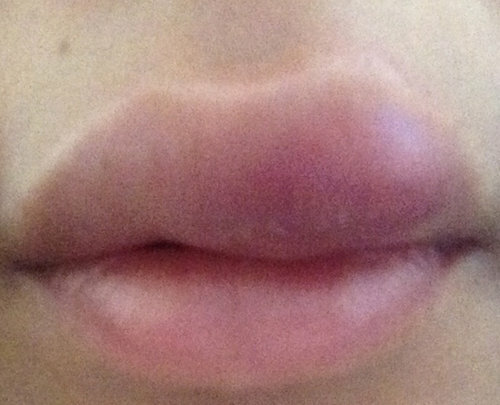 Allergic reaction – The upper lip may swell as a result of an allergy. It could be an allergic reaction to certain food groups, side effects of medications, use of lip care products, allergy to latex, and pet dander. Swelling of the lip secondary to allergy can be accompanied by other symptoms such as watery eyes, swelling of the face, and runny nose. It can happen to both children and adult. The swelling suddenly takes place, especially at night when you go to sleep. Upon waking up in the morning the following day, you noticed that there is something unusual in your lips. 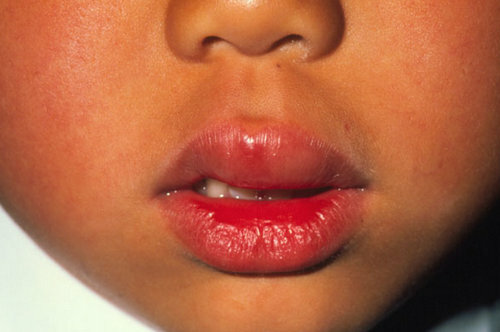 Angioedema – This is a condition characterized by swelling of the tissues beneath the skin, specifically in the areas of the lips and around the eyes. Infections – Various infections can lead to swelling of the upper lip such as herpes simplex virus infection, leading to the formation of blister or popularly known as cold sore. Inflammatory condition of the skin could also lead to swelling of the upper lip. Nutritional deficiency – If the upper lip swells, it is a telltale sign that your body lacks essential vitamins, especially vitamin B group. Aside from a swollen lip, vitamin B deficiency can also cause memory loss and abnormal changes in smell and taste. The body does not have the ability to produce vitamin B and so you have to get it from food sources and dietary supplement. Foods rich in vitamin B include dairy products, salmon, chicken, pork, and egg. Applying a cold compress on the upper lip helps reduce swelling. Do not directly apply the ice on the lip. You have to wrap the ice in a cloth and gently place on the infected upper lip for a few minutes. Repeat when necessary, but make sure to take in between break to avoid irritation of the swollen lip. Honey is known for its antibacterial property. Its healing property helps in alleviating pain and swelling. At the same time, it moisturizes the lips, reduce inflammation, and prevent further infection. To use the honey, just get a cotton ball and dip in a teaspoon of honey. Apply on the affected part of the lip and leave it there for about 30 minutes before rinsing. Do this two to three times a day. Adrenaline injections – If the swelling of the lip is caused by an allergy, an adrenaline injection is commonly used. What it does is it counteracts the harmful effects produced by the immune system. However, not all people qualify for adrenaline injections. You have to discuss with your health care provider if you are suffering from other health problems. It is the doctor who will decide if you are going to receive adrenaline injections or not. Antihistamines – Drugs that belong to the antihistamine group can help relieve the symptoms of swollen upper lip. They are prescribed by doctors. The doctor usually prescribe oral antihistamine. However, if the symptoms are severe, the doctor could resort to other forms. In the case of anaphylaxis, an emergency treatment should be given to the patient as soon as possible.